Five years ago, the newly formed Board at Kids Five & Over gathered around the kitchen table and brainstormed ways to build a nonprofit that could immediately support the needs of local children while planting deep financial roots into the future. We could not have imagined all the wonderful ways the next five years would unfold! From our first sponsorship in 2013 to our most recent one today, we’ve heard stories of children who simply want a chance. We’ve read heartfelt letters from parents, grandparents, educators, coaches and mentors asking if we can fill a financial void while families find their footings, and we’ve read thank you notes from children who say we’ve made their dreams come true. Nothing has been more rewarding than hearing from the children and knowing the financial support from Kids Five & Over has helped them be just that – children. In our first year as a nonprofit, we actively solicited donations so we could get on with the business of sponsoring children. In subsequent years, unsolicited donations sustained our mission. Imagine that? The P.O box filled up, PayPal sent email notifications of funds received, and anonymous donations arrived in the form of envelopes stuffed with cash. True story! 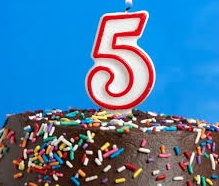 This year, in honor of our 5th birthday, we are circling back to year #1 and actively soliciting donations. We’re doing this because it’s a milestone birthday and that makes us feel as if we can yell from the rooftops, especially because bombarding you with requests for funding has never been how we roll. This year we are hoping for a burst of financial growth that will help expand our circle of support as we anticipate a record number of requests for summer funding. grow their talents and find their niche. so that each child can reach his or her full potential. In a time when over 80% of new nonprofits are said to fail, we are honored and humbled to feel lifted by your caring hearts. Our mission remains strong and our hearts hold great hope for the future.